Finish the construction of the circuit by adding the ICS-8 for the 555 timer and the ICS-14 for the LM339. Mount and solder all remaining resistors; R1 is a 1K resistor (color bands brown, black, red). R2, R4-R8, R12 & R19 are 10K resistors (color bands brown, black, orange). R3 & R11 are 1 Meg resistors (color bands brown, black, green). R13 is a 100K resistor (color bands brown, black, yellow). R15 & R21 are 330 ohm resistors (color bands orange, orange, brown). R16* is a 2.2 Meg resistor (color bands red, red, blue), and R20 is a 470 ohm resistor (color bands yellow, purple, brown). Next mount and solder capacitors C1 & C2 (.1uF), C11 (.047uF) and C12 (.01uf). Mount and solder the two 1 Meg, 25-turn potentiometers (R10 & R14). Insert R14 in the correct position and bend flat prior to soldering. Now mount and solder the 5.1V zener diode (D2), the Audio switch, power jack, headphone jack and digital output jack. Mount and solder the speaker, transistors Q1, Q3 & Q4 (2N3904), 2-pin headers (P2 & P13) and LED (the longer of the LED terminals is positive (+) ) to the PCB. The LED should rise 3/8” from the PCB to the bottom of the LED. This distance will insure proper placement of the LED when the PCB is mounted inside the case. Mount and solder the bridge rectifier making sure to align the + terminal of the rectifier to the + terminal on the PCB. At this point your Geiger counter pc board should look like Figure 7. *R16 is a 10 Meg resistor for LND712 GM Tube (GMT-01). R16 is 2.2 Megs for GMT-02 GM Tube. R16 is jumped with wire for external wand. This pages hows how to connect two different style GM Tubes (the GMT-01 & the GMT-02). The Geiger Muller tube has two leads. The GMT-02* is mounted on the bottom side of the case, see Figure 8 below. Use silicon glue to secure tube. The red wire from the GM tube is soldered to +GM tube lead on the PCB. The other wire is soldered to the (-) GM terminal on the PC board. The Geiger Mueller tube is delicate and needs to be protected in an enclosure. Keep sufficient length of wire so that you can open and close the case. *If using the LND712 Geiger Muller tube (GMT-01), R16 should be a 10 Meg resistor. The jumper at P10 should be omitted, bringing the output voltage to 500 volts. This Geiger Muller tube also has two leads. It is mounted on the bottom side of the PCB. The wire connected to the metal sides of the tube is the negative terminal. This is soldered to the (-) GM terminal on the PC board. The center terminal of the GM tube has a removable solder lead. Remove the lead, solder 1.5” of wire to and. Reattach the lead to the center terminal of the GM tube. Take the opposite end of the wire and solder to the (+) GM terminal on the PC board. The Geiger Mueller tube is delicate and needs to be protected in an enclosure. However the enclosure has a 1/2” hole that allows the front surface (mica window) of the GM tube to remain exposed. This way alpha particles can pass through the thin mica window and be detected. After securing with a wire, as in Figure 9, a small amount of glue or epoxy can be dabbed on the wire tube assembly for added support. sistor is is located inside the wand with the LND 712 tube. The connector for the wand, Jack-08, is soldered to the bottom of the PC board as shown in Figure 10. Before mounting the PCB inside the case, check to make sure the entire Geiger Counter circuit functions. Background radiation will cause the Geiger Counter to click about 12—22 times a minute depending on your location. When you are satisfied that the circuit is working properly we can mount the circuit inside the case. Mount the PC board to the front of the case. The shafts of the two PC mounted switch and LED should fit into the pre-drilled holes. The PCB is held to the case front using the two nuts to the PC mounted switches. 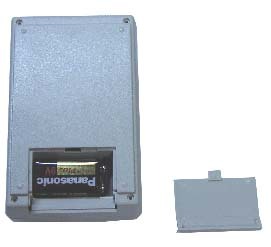 Finish by placing the 9-volt battery cap into the battery compartment of the back case. Close the case and secure with case screws. To install or change battery open battery compartment on the back of the Geiger counter and install or replace battery, see Figure 11. The headphone jack may be used for a headphones. When using the headphone jack for headphones the speaker is automatically cut-off. The digital output provides a TTL logic (+5V) pulse every time the Geiger counter detects radiation. This signal can easily be connected to a microcontroller or PC. 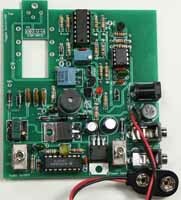 The PC or microcontroller can then be used to create a digital Geiger counter, chart recorder or other recording instrument for nuclear experiments. The digital output may also be used to connect an analog meter to the unit. The analog meter is an accessory that plugs into the digital output and provides a visual indication of the approximate radiation level. The GCA-01 may be powered by either a 9-Volt battery or external power source with a 2.5mm jack.